Police in Hopkins, Minn., came to the aid of a local family whose Christmas joy was stolen last week by a burglar. Most of the presents for Maritha Hill's family of four daughters and 1 grandson were stolen from under the tree by a thief or thieves who broke into and ransacked her townhome. Also taken were her 11-year-old daughter's tablet and iPod. Local police were moved by the family's tragedy and responded. 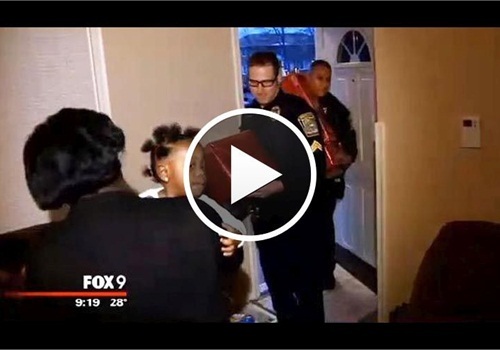 KMSP-TV captured the moment when officers of the Hopkins PD came to the home bearing both gifts. "Merry Christmas, we want to make your Christmas much brighter. We feel bad about the tragic situation you had happen so we wanted to use some crime fund donation money to replace all of your gifts," Sgt. Mike Glassberg told Maritha Hill. Investigators are working a few leads in the case and also made sure the townhome's locks were replaced and upgraded.